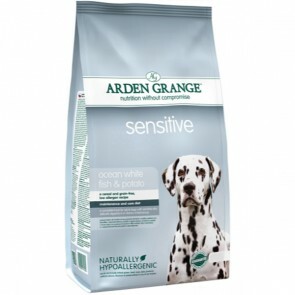 Arden Grange Dog food is hypo-allergenic and free from wheat, gluten, dairy products, beef and soya. It's a complete and balanced food with natural, wholesome ingredients that are easy to digest and delicious to eat. Arden grange also contains NO artificial colourings, flavourings or preservatives, reducing the risk of dietary intolerances and allergies that can cause digestive disorders and skin complaints, such as eczema, diarrhoea, dermatitis and flatulence! Many dogs unfortunately now suffer from dietary intolerances caused by the ingredients found in cheap dog food's, that some customers believe are just as healthy as the more expensive premium pet food brands, for example some cheap supermarket dog food's may contain artificial colourings, preservers, bakery products such as donuts, buns and stale bread, appetite enhancers and even items with no nutritional value such as wool, hooves, heads and risky material like spinal cord, that are NOT included in the range of healthy arden grange pet foods. Feeding your dog a hypoallergenic food like arden grange especially if your dog has been diagnosed with a specific food related problem is a cost effective alternative to expensive prescription diets that can usually be substituted easily, after you have discovered what triggers the adverse reaction. A simple blood test available from your vet, can help identify if there are any antibodies in your dog's blood to the ingredients found in their diet, allowing you to reduce or eliminate your dog's food related symptoms, by purchasing a diet suitable for their allergy needs. Arden grange dog food contains either Fresh Chicken, Grade A Chicken Meal, Fresh Salmon or Lamb Meal as the primary source of protein, allowing you to identify exactly what you are feeding, which is essential if you are to avoid a protein source that is problematic, so that your dog can lead a normal happy life! Like all premium dog foods, the diets are suitable for all breeds not just those with specific dietary problems, that require a food that uses wholesome, natural, gentle ingredients formulated around a single source of protein either from meat or fish meal, for example chicken meal which is simply chicken meat with all the water removed, to create nutritious recipes suitable for all dogs, especially those dogs which suffer from food related allergies or sensitivities to certain forms of protein. Food related intolerances to ingredients found in many dry or wet dog foods is unfortunately common, they usually develop over time and are normally NOT instant a common misconception. For example protein sources like beef or dairy are known to trigger adverse reactions, but chemical additives, artificial colourings, preservers and flavourings can also be problematic, that's why premium pet food's like arden grange, burns and wafcol exclude these from their dog food recipes! Each arden grange dog food recipe has been carefully developed to cater for the lifestage and breed size of all dogs, with various flavours available to help those dog's with special dietary needs and sensitivity to certain sources of protein, for example Arden Grange Sensitive Ocean Fish & Potato that is 100% grain and gluten free for dogs that suffer from adverse food reactions, cereal allergies and intolerances, Arden Grange Lamb & Rice to calm a dog's digestion and avoid skin complaints, Arden Grange Large Breed Puppy Junior that has been specially formulated for the nutritional demands of large and giant breeds using large kibbles, and lastly Arden Grange Light Chicken & Rice that is lower in both protein and oil than the adult varieties for overweight or less active dogs that gain weight easily and can't loose the pounds. Making a choice as to what dry food is suitable for your puppy or dog can be quite confusing, especially if you are a new owner that's been given conflicting advice from your breeder, vets, friends and relatives as to what diet they would recommend buying, so we have created an Arden Grange Comparison Chart that lists the benefits and features of each individual dog food displayed on the website to make your selection a little less daunting, that you can download to your desktop. Regardless of price or brand we actively recommend to customers at Valupets you read the label on your food and never buy anything that contains any of the following nasty ingredients which are completely un-ethical and should be banned; Ethoxyquin that's a herbicide used as a preservative and is often associated with the development of kidney and liver damage, but also cancer (such as spleen, liver, stomach, skin) immune deficiency and leukemia; Propylene Glycol found in anti-freeze used to reduce moisture and prevent bacteria growth in some dog foods increasing the sale by date that can cause some dogs to develop cancerous lesions in their intestines; BHT/BHA another dangerous preservative responsible for kidney damage and cancer in both humans and dogs. Why not read the customer reviews and our original in depth product descriptions for more nutritional information, that can be found for each arden grange variety or simply submit a question to us by email to allow you to make an informed choice as to what food is suitable for your breed, size or age? If your dog still enjoys the taste of moist or wet food, but you don't want to feed unsavoury supermarket tins, arden grange has created three delicious varieties that are hypoallergenic and contain only high quality ingredients, called Arden Grange Partners that can be mixed with any complete food or mixer to satisfy the fussiest of appetites! All arden grange recipes are naturally preserved using mixed tocopherols, vitamin e, rosemary extract and contain glucosamine, chondroitin and MSM for joint maintenance and bone development. Yucca extract is also included in each diet, regardless of flavour or variety and has been proven to help lower your dog's odour! 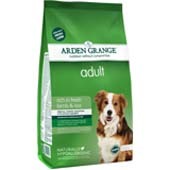 Unlike many premium dog foods, arden grange is not only hypoallergenic, but also contains absolutely NO fillers used by some un-reputable manufacturers to add bulk to pet food or hidden meat and animal derivatives, consequently the list of ingredients displayed on the bag are the only ones used to create each variety. Owners that have dogs with diagnosed dietary sensitivities are often faced with a dilemma, when it comes to rewarding their dog, as many treats on supermarket shelves contain animal derivatives that can trigger adverse food reactions, leaving owners feeling guilty especially if they have more than one dog, but only one with a food intolerance. So arden grange created a range of hypoallergenic treats available in various flavours including chicken, lamb, salmon and a light version that is lower in calories, to compliment the various puppy and adult dog foods, that are sold in economical 5kg trade boxes making them more affordable to feed than small expensive packets, just visit the Arden Grange Crunchy Bites page for more details or view our range of Healthy Dog Treats that don't contain any artificial flavours or colours including 100% natural fillets. As you would expect from a premium pet food all the diets and delicious crunchy bite dog treats are GM Free, but also contain added prebiotics MOS and FOS which help promote the growth of friendly gut bacteria, that in turn reduce the build up of harmful bowel flora, helping your dog digest and absorb beneficial nutrients essential for long term health and wellbeing. Simply select any two bags of dog food or crunchy bites shown below and receive Free Mainland UK Delivery! How do I make a comparison between premium dog foods? We are asked frequently by customers, what we suggest they feed their dog as many owners are quite literally bewildered by the amount of premium brands, like arden grange competing for their custom and often confused as to which food will be suitable for their dog or new puppy. The simple approach to comparing dog foods, like arden grange, burns and wafcol so that you don't become overwhelmed by the marketing is simple to concentrate on finding out what's actually in the bag, so that you can make a direct comparison more easily. The best way in our opinion to obtain this information, as it requires the minimum amount of effort is to visit a brands website and look for the ingredients and typical analysis section, that will list by law if the food contains any meat derivatives, bakery products, artificial colours, preservers and colourings etc. There are essentially two options when it comes listing the composition of any food, either by the individual ingredients such as lamb, chicken and rice for instance that allows owners to judge for themselves the quality of their pet food easily or by using category names to describe the group of ingredients used, like meat and animal derivatives, cereals and vegetables giving cheap brands the flexibility to change their foods depending on price and availability. We suggest you look at the ingredients section and find out what beneficial minerals and vitamins are listed, if the food is meat or fish based, if it's naturally preserved and if the dog food contains prebiotics or nucleotides for digestion. After you have familiarised yourself with the ingredients, including the vitamin and mineral levels, you can then make direct comparisons easily and decide for yourself if arden grange or any other food is suitable for your dog or puppy. But also importantly if the diet offers good value for money when compared with other brands, for example hills, euknauba and royal canin that are traditionally more expensive. Due to new labelling laws introduced, known as functional ingredient claims a food must not make unsubstantiated statements regarding any health benefits, consequently if the dog food you buy states it contains for instance glucosamine, chondroitin and msm for your dog's joints, the supplement levels must be high enough to have a beneficial effect, otherwise you are not allowed to make that claim on your bag of food, product literature or website. Nearly all the premium dog foods, including arden grange stocked by pet shops or advertised in magazines are produced by independent pet food manufacturers on behalf of the brands we are familiar with, as it simply does not make any financial sense to have your own plant and machinery. For example brands such as arden grange, burns and wafcol are all produced by private label manufacturers, to the specification they request. That's one of reasons why we recommend to all customers to read the reviews and compare the ingredients of any premium dog food to help you understand what you are actually feeding your dog, especially considering most dog foods are manufactured by a few large independent pet food suppliers. Free arden grange samples can be sent with any courier order, as we are a registered online stockists, so please let us know if there's a variety you would like to try and we will arrange for a sample to be included with your order. We always recommend to our customers that you moisten any complete dog food with cold or warm water, unless your dog prefers it's dry, so that you dog absorbs water whilst eating to aid digestion. Please don't hesitate to contact us if you require any advice or information regarding any pet food or accessory featured on this website, we are more than happy to answer any questions you may have! Nutritional advice regarding arden grange range of premium dog foods featured on this website is also available FREE on: 01273 833 390 or by contacting them using the nutritional enquiries page on their website, that displays the recommended feeding guides for each arden grange variety including the adult and puppy junior recipes. Allowing you to calculate approximately the daily feeding cost for your dog and the amount of time you can expect a 12kg bag of food to last before you need to re-order! All arden grange varieties featured on this website are in stock and normally dispatched the same day if your order is received before 1pm, excluding weekends and bank holidays, delivered to your door within 24 to 48 hours. Unlike some online stockists our prices are always competitive, from one week to the next and we allow you to mix n match any two arden grange 12kg varieties or selected dog food brands for Free Mainland UK Delivery to suit your feeding requirements. Lastly arden grange is an ethical pet food company that's committed to the welfare of animals, so none of the dog food's advertised on the website, have been develop or refined as a result of funding invasive research projects on animals in laboratories, consequently all their food packaging features a not tested on animals logo guarantee to demonstrate it's pledge. Please visit the other pages of this website for more information about alternative hypoallergenic dog foods such as: Natures Choice, Burns, James Wellbeloved, Wafcol, and Skinners so that you can find a food suitable for your dog's specific dietary needs and budget! Arden Grange: 5 stars out of 5 based on 145 user reviews. My two dogs love them always have. These biscuits arrived with my dog's main dog food. She has had them before and as always they are truly enjoyed. Many thanks for excellent service. This is the first time our dogs have tried the "new" crunchy bites in the chicken flavour, but as normal with the previous range they go "crazy" for more. We have to be really careful that they are stored away safely or they would have the lot! I have been using Valupets for about 5 years and am delighted with the fantastic prompt service and great value for money. Arden Grange is an excellent product that I would thoroughly recommend. Bought these Crunchy bites for my golden retriever when I ordered her regular dog food. She loves them!! Will have to order some more. The service was excellent and delivery too. Thanks. Matthew and the ValuPets team have always delivered a first class service. My first and only choice for pet supplies, I have no hesitation in recommending them and have done many times. This Arden Grange variety is great now that my dog is getting older and does not use as much energy as she used to. Always a good service from ValuPets. Fed my last labrador on Arden Grange and I have fed my current labrador on Arden Grange from a puppy. Both dogs have been complimented on their good coat condition and overall physical condition. . Valupets provide an excellent service and with their current couriers provide next day delivery with an identified 1 hour delivery window. Brilliant.